On 29th December 2009, the ComAfrique team along with Mr Omar Gibba (Dy. Chief of Protocol, Office of the President, made an initial survey of the 4 villages. On the 4th of January, 2010, ComAfrique Limited invited representatives of the 4 villages to explain the implementation procedure. In consultation with the Dy. Chief of Protocol, dates for the final implementation were fixed. From January 8th to the 11th, ComAfrique team comprising of Mr Nfamara Dampha, Mr Mustapha Njie, and Mr Ram Mohan driven by Mr Modou Bah with Mr Sheriff Sowe of Safari Motors (TATA Representative) and accompanied by GRTS Reporter Mr Ebrima Jatta and cameraperson Mr Joof undertook the implementation of the first four villages. The Implementation team decided that it would be ideal to do all villages on one trip, spending one night in each of the villages, thereby giving us an opportunity to experience the effect of the lights in the villages. Our experience has been overwhelming. A Very Warm reception was accorded by the Alkalo’s representative, Mr Backary Jarju. Our First activity was requesting them to set up the Village ZonLight Committee. The Committee agreed that the village would participate in the sustainability programme of 1 Dalasi per day per Light. The full village was asked to gather in front of the Alkalis compound at sunset. We set up a demonstration Street Light and a work table around which the ZonLights and ZonHomes for distribution were arranged. A list was drawn up with village compound representatives’ names and the number of lights to be given to each compound. This was worked out on the basis of the number of individuals living in each compound. This included ZonHomes for the Alkalo residence as well as for the Mosque, School Head and the Medical Centre. The presentation ended with prayers to the Almighty and with thanks being showered on His Excellency, President Jammeh for encouraging the initiative from ComAfrique and to ComAfrique for their Light up a Village with ZonLight Initiative. A Certificate of Implementation of the Initiative was signed by the ComAfrique Team as well as by the Village ZonLight Committee and witnessed by the Alkalo. A copy of this certificate is attached. The entire ComAfrique team and the GRTS crew slept late that night while Jakoi Gibbirick cheered the entry of simple lights into their lives. The hospitality in Villages that we have seen has been in true reciprocity to the nature of the event. Each member of the team was housed with one of the families. The ComAfrique and GRTS team then left the following morning to Battendeng. A much smaller village than Jakoi, but with the same big enthusiasm. This village designated by His Excellency, President Jammeh, was sponsored by TATA Africa-Safari Motors. With 8 Compounds, 59 Lights were distributed to a very excited village. The Alkalo and villages sang songs in praise His Excellency, President Jammeh. They sang for TATA Africa – Safari Motors and thanked ComAfrique for the initiative. The Alkalos residence, The Village Mosque as well as the night Koranic school benefited with having ZonHomes allocated. The following morning the team thanked the hosts for their hospitality and left for the village of Bujingha in Foni Kansala District. A right turn before the Bwiam Hospital, and a few kilometres drive brings you to the village of Bujingha. A very well organised representative of the Alkalo, Mr. Modou Bojang met the team and immediately set about organising his Village ZonLight Committee. This village was all the more excited because H E, President Jammeh had personally sponsored as well as selected the village. They understood the seriousness of the sponsorship and this was seen in their attitude – very positive. The Ceremony began as usual with a prayer of thanks and loud cheering marked every household as their representative received the designated lights. The simplicity of the lights and yet the effect they have were constant reminders of how important light is. The ComAfrique team helped install the ZonHomes in the Alkalos residence as well as the Mosque. Hospitality here was at a peak demonstrating the appreciation of the arrival of the Implementation team. The ComAfrique and GRTS team then left for the village of JIRRAMBA. JIRRAMBA VILLAGE (Foni Kansala District) (Sponsored by His Excellency, President Jammeh) – 11th January, 2010. A few Kilometres after Bwiam, a left turn and a couple of kilometres brought us to this fairly large village. Sidi Gibba, the very young son of Alkalo Mr Jerreh Gibba was our point of contact. We wanted to attempt a day time ceremony to enable the GRTS crew to return to Banjul to cover other engagements. However the hospitality and the enthusiasm of the villagers made us stay back and implement this village too in the evening. A Large and diverse Village ZonLight Committee was selected. Nfamara Dampha listens to a Villager of Jirramba while the Alkalo, Mustafa Njie and the Village Committee listen. This village seemed a far more affluent village with several vehicles driving past and all children neatly dressed in school uniforms. Yet the absence of light and the excitement among young and old alike gave one a feeling that this was really important to them. Families that did not have compounds as yet, wanted to sign up and take lights – willing to pay the ONE Dalasi per Light in advance. Reactions have been very energising for all of us. We are determined to take this further. In a very heart warming gesture, the village of Jirramba even wanted to take an additional ZonHome for the neighbouring village Mosque. At the end of the ceremony, the Certificate of Implementation of the Initiative was signed by the ComAfrique Team as well as by the Village ZonLight Committee and witnessed by the Alkalo. A copy of this certificate is attached. Thus came to the end of a very exhilarating trip and the beginning of a long voyage for ComAfrique, where we will endeavour to attract more sponsors with participation from ComAfrique as well. ComAfrique have assured each village that they will sponsor ONE Rural Street Light to Each Village being sponsored (at 6,000GMD each). This light can be mounted in a central place in the Village. The Village ZonLight Committee will be responsible to find a manner to make this light sustainable as well. These will be installed as soon as they arrive and the housings are fabricated in The Gambia. 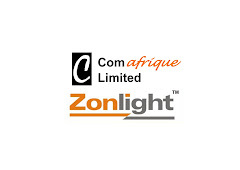 ComAfrique Limited would also like to mention that the ZonHomes are now being assembled in The Gambia. The ComAfrique Team would like to profusely thank His Excellency, Sheikh Professor Alhaji Dr. Yahya A J J Jammeh for the immense support given in implementing this Initiative. We would like to believe that this is only the beginning and that we will work towards getting more sponsors for ZonLights and ZonHomes in villages to make rural Gambia energy independent and bright. We would like to thank the Office of the President, Secretary General, Government of The Gambia, Mr Omar Gibba (Dy Chief of Protocol) and the Director of GRTS Mr M Sanyang as well as the very enthusiastic and hard working GRTS team of Mr Ebrima Jatta and Mr Joof. Our thanks also go for the encouragement given by the Ministry of Energy, Ministry of Petroleum and PURA for giving us moral support to move ahead. Our profound gratitude goes to Mr Sumeet Tank of TATA Africa and to Mr H R Aswani and Mr. Ram Aswani of Right Choice Supermarket who have also taken the cause in sponsoring villages. And of course we cannot but thank the people of The Gambia without whose support, no sustainable project could ever move ahead. Ofcourse - Finally we thank our partners and the developers of this wonderful technology, InteliZon and Dr Kushant Uppal for thse wonderful inventions that will transform dark corners of the globe into brightness. We thank Mr Har Krishnan Nair of Western India Cashew Company who has involved himself with this project in Africa.